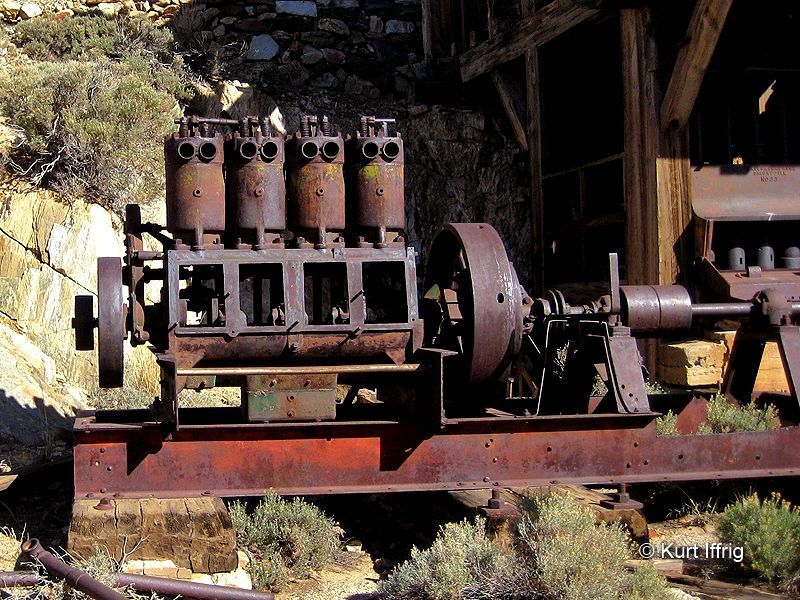 The upper deck of Lost Horse's 10-Stamp mill, considered to be one of the best preserved mills in California. Years of Operation: 1894 through 1931. 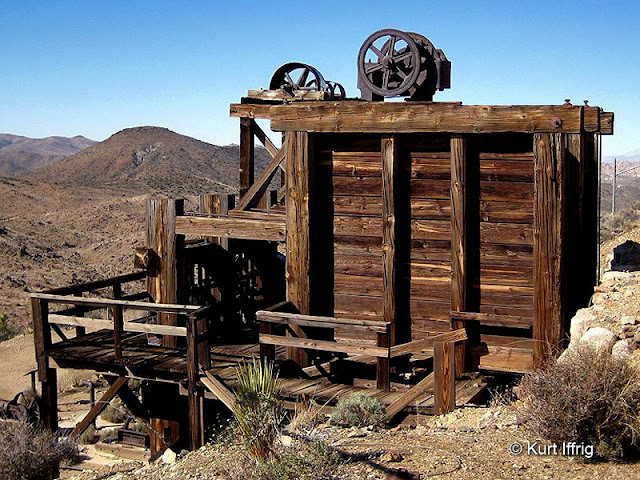 This mine was one of the area's richest, producing 10,000 ounces of gold and 16,000 ounces of silver. Depth: All of the shafts and adits have been backfilled. There was once a shaft directly behind the stamp mill, but after the mine closed it began to create a sinkhole and was filled in. The main shaft was 500 feet deep, with horizontal tunnels at each 100 foot level. I also found other backfilled shafts near this site. Originally a 3.5 mile pipeline brought in water to power the mill with steam, later replaced by a gas engine. In 1893, John “Johnny” Lang purchase a claim which would become the Lost Horse Mine, a property that would become the area’s richest mine, producing 10,000 ounces of gold and 16,000 ounces of silver (approximately $12 million in today's dollars) between the years of 1894 through 1931. Lang named the mine after a horse he was tracking that was lost while herding cattle. The horse's trail led straight to the camp of the McHaney Gang, notorious cattle rustlers and horse thieves. Lang found the horse, but Jim McHaney told him his horse was “no longer lost” and to move on, or else. Johnny decided it would be in his best interest to heed that advice. Lang was no stranger to violence. Prior to moving west to California his brother and six cowboys he worked with were all gunned down in New Mexico. 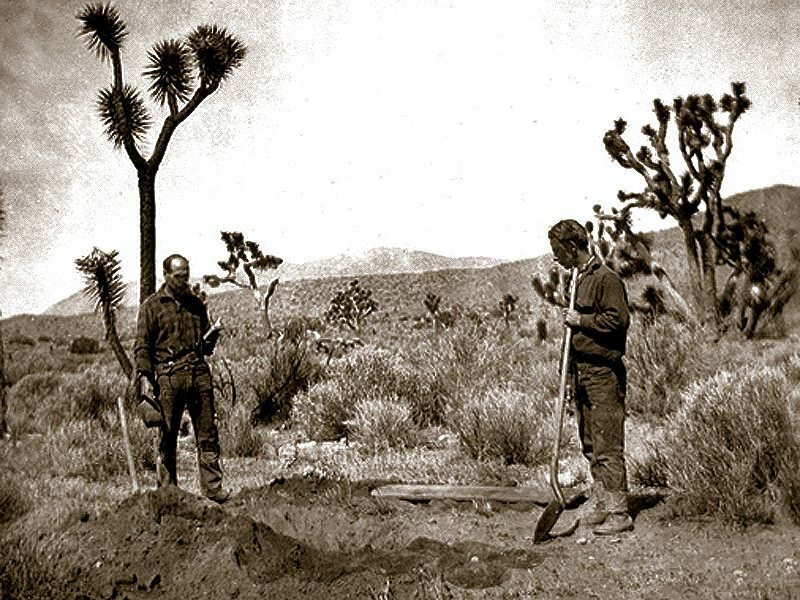 On his way back from McHaney's camp, Lang met up with a man named “Dutch” Frank Diebold, who claimed he had discovered a rich gold claim, but was afraid to develop it because of the rustlers. After sneaking in to inspect the claim, Lang and his father bought the rights to the mine for $1,000. One of several pieces of machinery on site, including a compressor, a winch and a gas powered engine. Lang, his father George and two partners, Ed Holland and James Fife began work immediately, and a two-stamp mill was built. But the McHaney Gang was an ongoing problem for miners in this area. If they found a lone prospector they would steal whatever he had. Lang’s partners managed to protect the mine from claim jumpers and provided the capital to get it up and running. 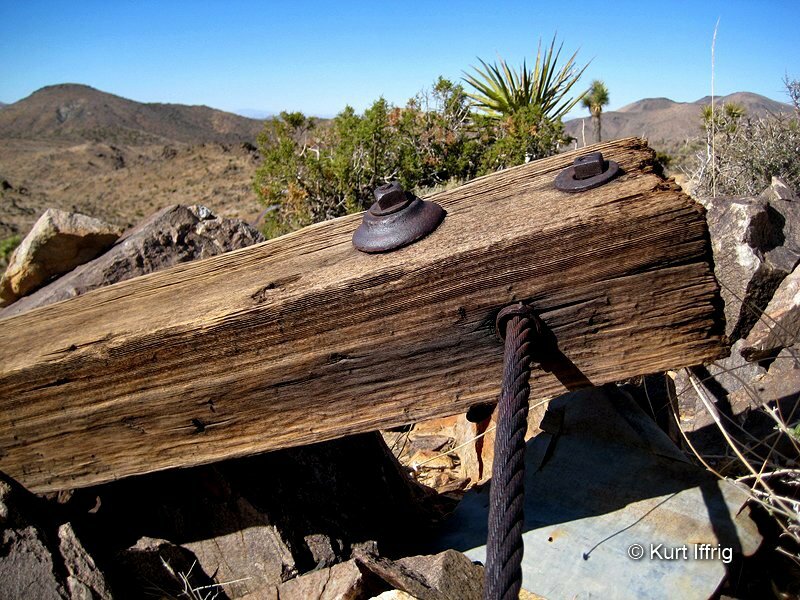 To avoid detection from outlaws, Lang's gold ingots were hidden in a freight wagon and transported to Indio. This ruse apparently fooled any would-be highwaymen. This winch can be found above the mill site, next to the remains of a stone building, or possibly a reservoir. In 1896 Lang sold the majority share of the mine (75%) to J.D. Ryan, a rancher from Montana, and family members Jepp, Matthew, Ethan and Samuel Kelsey. The original 2-stamp mill was replaced by a 10-stamp, which still remains today. Ryan was a wealthy rancher from Montana, but the mill was actually found somewhere near the Colorado River, disassembled and hauled all the way to the Lost Horse mill site. The Ryans also erected a 3.5 mile pipeline from Lost Horse Well to the mine to provide steam for the mill. After selling the majority of ownership to Ryan, Johnny Lang stayed on and worked the night shift at the mills. But soon the Ryans noticed that ore production at night was consistently less than the day-shift production. They hired a private detective and discovered that Lang had been skimming gold amalgam. Johnny was confronted and given a choice, sell his share of the mine for $12,000 or go to prison. Lang chose to sell out. This was probably part of a cable pulley system used to transport ore buckets from nearby hilltop shafts. After selling out his stake in the Lost Horse Mine, Johnny Lang moved to a nearby canyon that now bears his name. He lived in a cabin and milled a small amount of ore from a new mine, the Sulfide-Bismuth Mine. According to Bill Keys (former owner of the Desert Queen Mine and Wall Street Mill), Lang returned to the Lost Horse Mine to recover some of the old gold amalgam he had buried. Occasionally Lang would be seen on the property spooking around. He'd be run off each time. Threatening him with jail, or worse finally ended his trespassing. Lang lived a hermit-like life, and his health declined. One day Lang went for grub and never came back. His mummified body was found weeks later. 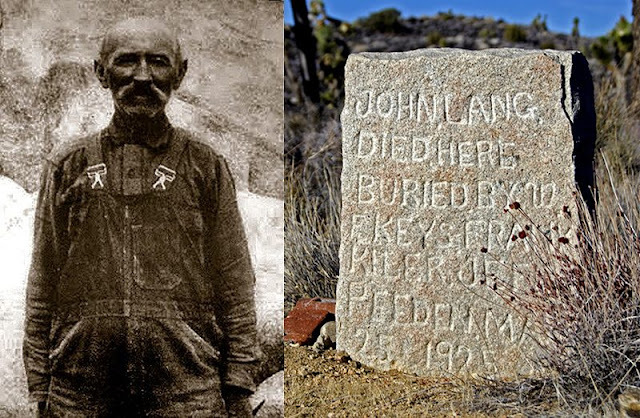 One day in January of 1925, Lang left a note on his cabin saying, “Going for grub, be back soon.” Bill Keys found his partially mummified body on March 22 near a road he was building to his Hidden Gold Mine. The only possession found on him was a small piece of bacon, wrapped in wax paper. Keys returned three days later with Jeff Peeden and Frank Kiler to give Johnny a proper burial. Bill Keys and Jeff Peeden at Johnny Lang's burial. Looters dug up his grave twice, looking for his lost gold. The years 1895-1908 saw peak production at the Lost Horse Mine, with operations yielding large quantities of gold and silver. Improvements at Ryan Ranch in support of the mine included an assay office, cookhouse, and bunkhouse. 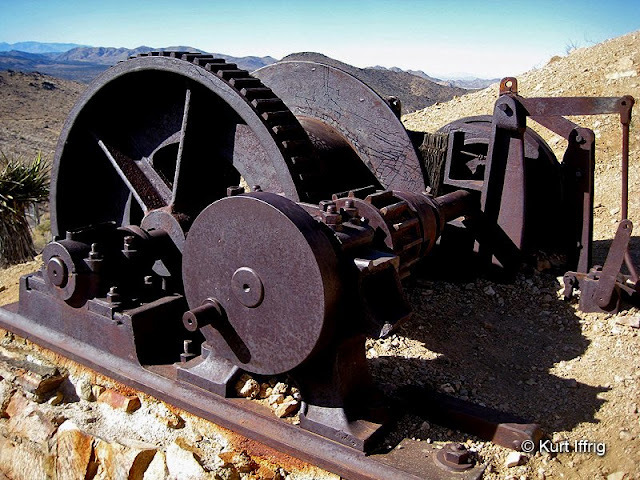 After 1912 the mine was often shut down, although occasional upgrades were made, such as replacing the steam-powered equipment with gas. Though the Ryans sold the Lost Horse Mine in 1912, they held operational control of the property into the 1930’s. Today little is left of the original buildings, but a beautifully preserved 10-stamp mill and some large pieces of machinery still remain. When the park service took over this area in 1936, wooden portions of the cabins and the headframe above the main shaft had already collapsed, and earthquakes began to create a sink hole near the mill that threatened the entire structure. Cable netting and concrete caps were added to protect visitors, but even they were swallowed up by the hole. Then, in 1996 a new technique for capping mineshafts was tried. Polyurethane foam, similar to material used for home insulation was injected into the hole as a stabilizing plug. This method, called puffing has since been used to seal several shafts in the park. After sealing the shafts dirt was added to protect the foam from UV light, and a replica shaft collar was added. Most trees that once grew here were cut down by miners, used as fuel for the boiler that powered the mill. According to local legend, Johnny Lang hid his stolen amalgam somewhere near the mill site and was unable to get to it before Ryan ran him off, although he tried several times. Lang would continue to prospect in likely spots to the west, but failed to find anything substantial. However he may have recovered at least some of the amalgam stolen from the Lost Horse Mine. Local homesteader and rancher, Bill Keys recalled Lang selling him "pure gold bullion" several times. Lang died broke and hungry. While living in his tiny cabin he had shot and eaten all four of his mules and was forced to walk to town for food. When Keys found his body he was wrapped in a canvas sleeping bag. 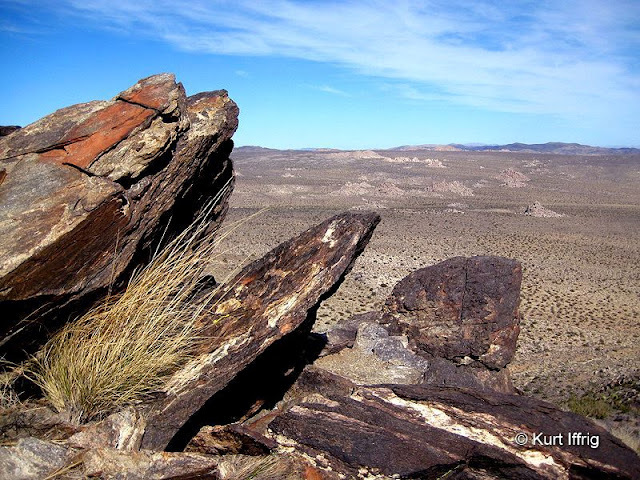 Joshua Tree includes both the Mojave and Colorado deserts. About two-thirds of it is pure wilderness. It’s quite possible that working with mercury for a prolonged period led to Lang’s poor health, and even to his strange behavior. The term “Mad Hatter” comes from a famous case of a hat maker turned soldier in the Civil War who shot and killed Abraham Lincoln’s assassin, John Wilkes Booth, despite strict orders to take him alive. Mercury poisoning or Korsakoff’s syndrome was often found in people who used mercury to cure hats. The condition leads to slurred speech, tremors, stumbling, and in some cases, hallucinations. It was often mistaken for insanity in those days. Cabin ruins near the Optimist Mine site. There's also an old bed frame and numerous rusty artifacts. After Johnny’s burial, stories of his gold stash persisted. Thinking a map might be buried with the body, the grave was dug up twice, the second time Lang’s skull was stolen. Since then the remains have been moved, but the grave remains. If you want to find it you’ll have to do your own research, the park service does not reveal it’s location. To this day people continue to look for Lang’s lost gold, but if you’re one of them, know that the digging up or removing artifacts from a national park is a federal crime. 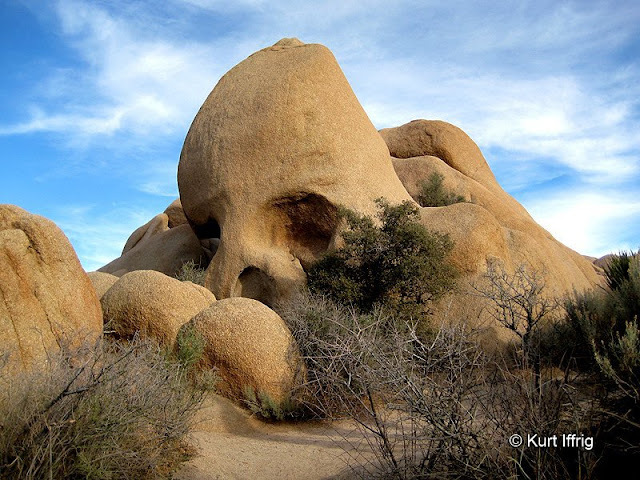 This is the famous Skull Rock. 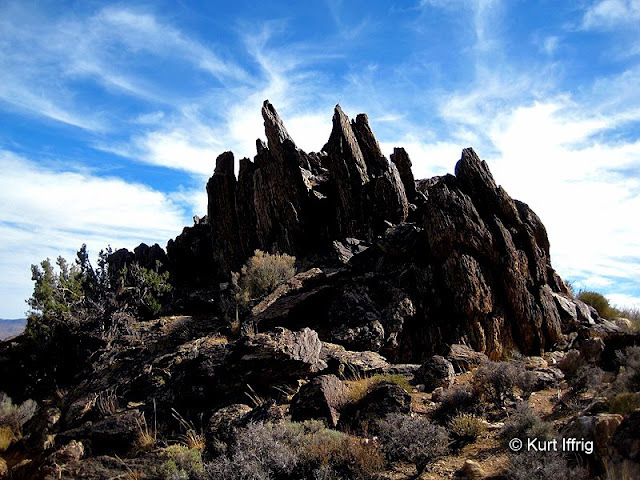 Other named rocks in this park include Arch Rock, Cap Rock and Split Rock. What’s left of the Lost Horse Mine stands next to a eight mine long trail that loops around Lost Horse Mountain. If you take this trail clockwise you’ll pass some spectacular vistas, looking out onto the vast Mojave Desert. And you’ll notice that there are very few Joshua trees on the northern side. This is the result of miners who chopped them down to use as fuel for the steam boiler that originally powered the stamp mill. Later a large gas powered engine was brought in to replace it, but sadly the trees never grew back. You’ll also pass a few more mines, though not much is left of either. 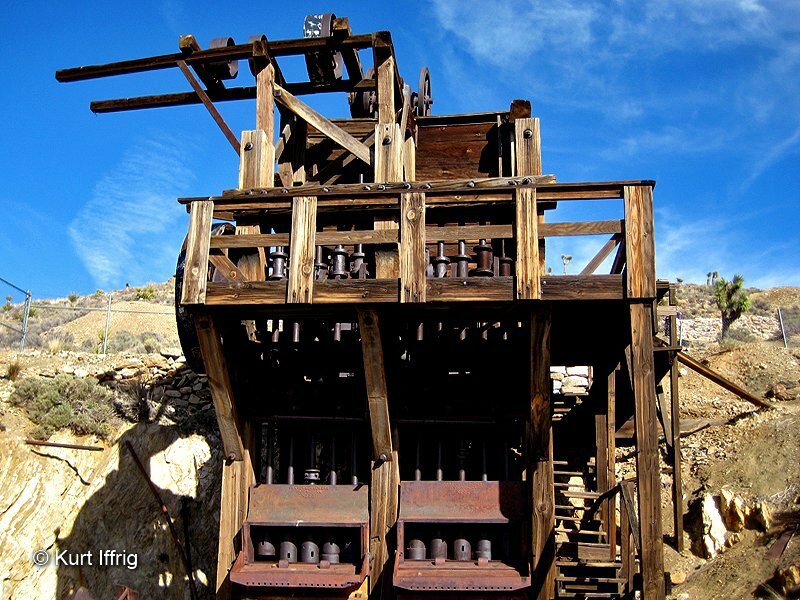 The park service handles these mines in different ways according to perceived risk. Shafts in this area have all been back filled. In other areas there are gates placed over shafts and adits, some loosely. The more remote areas are considered less risk to the public and some are still open. From what I’ve seen so far, most horizontal mines less than 30 feet deep are generally un-gated. One of the mines on the east side of Lost Horse Mountain was called the Optimist Mine. 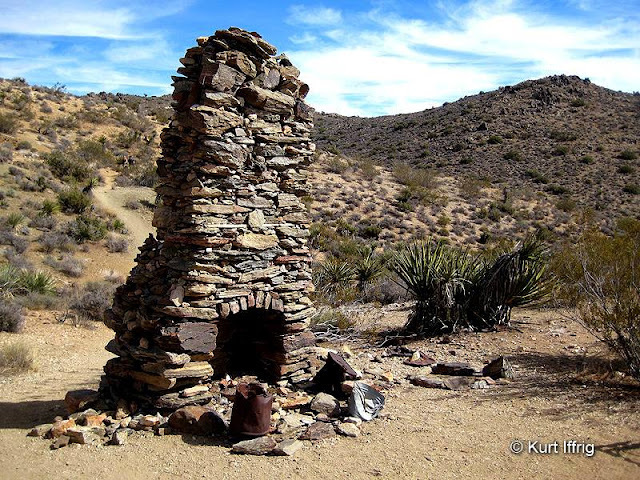 The shafts have all been back filled, but the chimney of an old miner’s cabin and a metal bed frame still remain. You can see a photo of it by scrolling up. 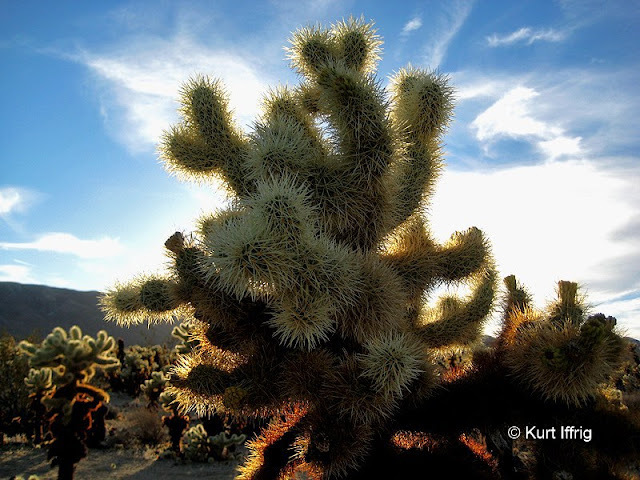 This is the Cholla Cactus Garden, a huge swatch of land where hundreds of so-called "jumping cactus" grow.